Transiting Mangal the lord of his eleventh house of gains will be in the tenth house of success, under the aspect of natal Mangal. Guru the lord of the tenth house will be in the eighth house, under the aspect of its own natal position. 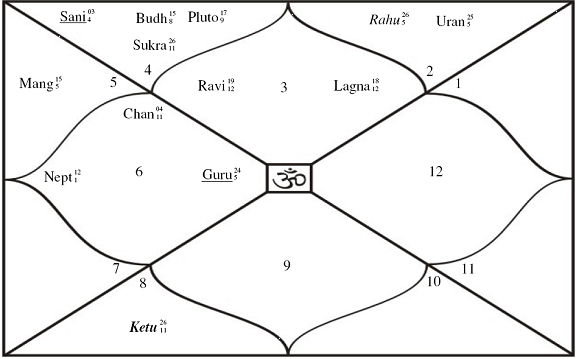 The lord of the eighth house, Saturn will be in conjcuntion with natal Mangal in the third house of courage and efforts, aspecting the ninth house, of bhagya and luck, the house it owns. Surya, the lord of the third house will be exalted trine to its own house, in the eleventh house of gains. Here too, there is a Transiting Parivartan, where the ninth, tenth and eleventh houses are involved. Ganesha feels that Ram Vilas too will be able to win the elections in his constituency and win a good amount of votes, but not as much as what Lalu and his gang will be able to clinch. Success assured, he will be able to cut the votes of Cong (I). Wishing him good luck an dmay Lord Ganesha bless him.